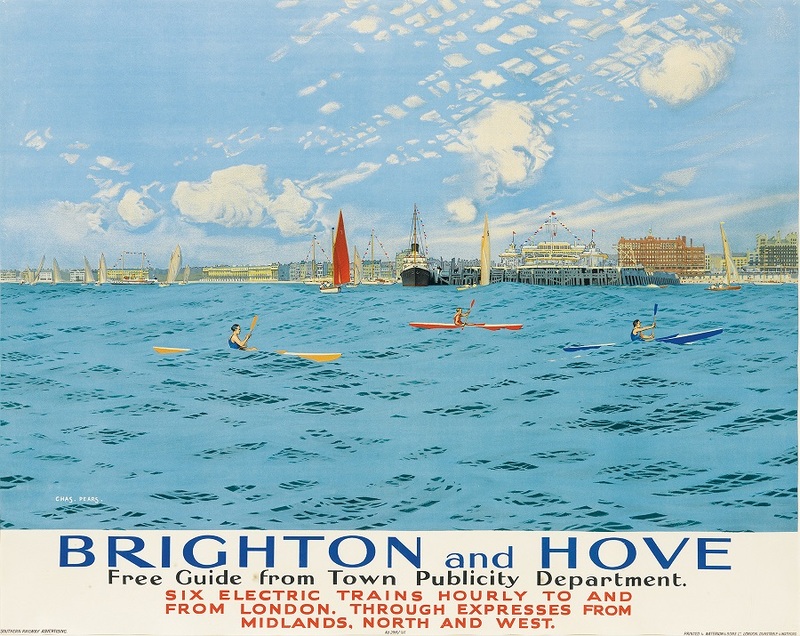 A rare poster advertising Brighton as a tourist destination is going up for auction in New York later this month. Swann Auction Galleries is holding a rare and important travel posters auction on October 25, and this item, by renowned railway poster artist Charles Pears, has a guide price of $1,200 to $1,800. The description says: “A kayaker’s view of the Brighton Pier and the Palace at the far end. The poster was produced for Southern Rail in 1935. It’s matted and framed, measures 99cm by 125.75cm, and its condition is described as B+, with some creasing and repairs. The actual auction will take place at Swann Auction Galleries, in New York, but you can also bid online from anywhere. Click here for more information. Six electric trains hourly to and from London, amazing!